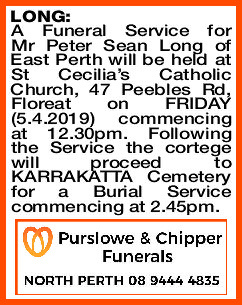 A Funeral Service for Mr Peter Sean Long of East Perth will be held at St Cecilia's Catholic Church, 47 Peebles Rd, Floreat on FRIDAY (5.4.2019) commencing at 12.30pm. Following the Service the cortege will proceed to KARRAKATTA Cemetery for a Burial Service commencing at 2.45pm. 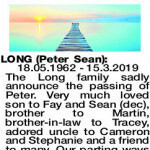 18.05.1962 - 15.3.2019 The Long family sadly announce the passing of Peter. 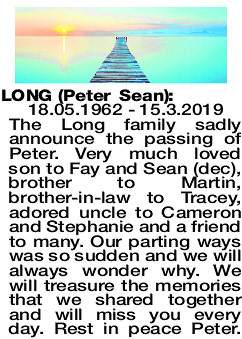 Very much loved son to Fay and Sean (dec), brother to Martin, brother-in-law to Tracey, adored uncle to Cameron and Stephanie and a friend to many. Our parting ways was so sudden and we will always wonder why. We will treasure the memories that we shared together and will miss you every day. 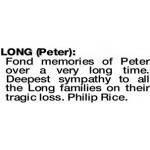 Rest in peace Peter. 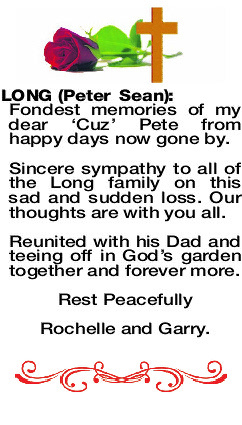 Fondest memories of my dear ‘Cuz' Pete from happy days now gone by. Sincere sympathy to all of the Long family on this sad and sudden loss. Our thoughts are with you all. Reunited with his Dad and teeing off in God's garden together and forever more. 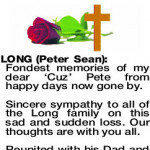 In loving memory of Peter. Time spent with you will be remembered always. We will hold you in our hearts until we meet again. Jenny and Phil. Fond memories of Peter over a very long time. Deepest sympathy to all the Long families on their tragic loss. Philip Rice.